Many are left with no option but to attempt the extreme, like cross a river in sub-zero temperatures. 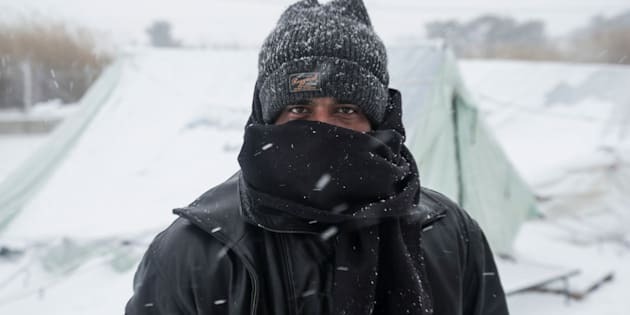 The death from hypothermia of another migrant, discovered in Greece on Monday, is a stark reminder of the extreme weather conditions displaced people are facing. The man, aged about 30, was pulled from under a meter-high pile of snow near the country’s border with Turkey, Greek news agency ANA - MPA reported. He’s the second migrant to die since the beginning of 2017 as a result of the snowy, sub-zero temperatures. An Afghan man was found dead on Jan. 3 after reportedly crossing the Evros River. The route across the river is one of the more common passages from Turkey into Greece: In 2015, thousands of migrants and refugees used it and in recent months there has been an uptick in activity, according to the Associated Press. Smugglers normally ferry people across the river in boats but it’s also common for people to wade the entire way, Panagiotis Ageladarakis, the mayor of one of the border villages said. Greece has become a holding pen of sorts for migrants and refugees. There are an estimated 62,000 people currently stranded in the country, according to U.N. Refugee Agency figures released earlier this month. Approximately 34,000 of them are on Greece’s mainland, while several thousand are still living in refugee camps on various islands. Thousands of people were once able to travel freely from Turkey to Greece and then further west to countries like Germany and the United Kingdom but a deal cut between the European Union and Turkey in March significantly halted these flows. While only small handfuls of people have been traveling from Turkey to Greece since the deal was struck, border closures in Greece’s neighboring countries have penned people in. Those stuck in the country must now apply for asylum there rather than being able to travel onwards to reach their European country of choice. Many are living outdoors in squalid camps. The extreme weather that has swept the country in recent weeks is making surviving all the more difficult. But all is not lost. The Greek government has stepped up its emergency efforts, working with organizations like UNHCR to move more people to the mainland and docking large ships in island ports that can accommodate hundreds on board. Dozens of other volunteer organizations are also on the ground day in and day out providing life-saving assistance. “We reiterate our call to increase safe pathways for the admission of people in need of protection, including via resettlement, family reunification, private sponsorship and other mechanisms to provide a viable alternative to irregular movement and reliance on human smugglers,” UNHCR spokeswoman Cécile Pouilly said Friday in a statement.